What Do I Do If PDFelement Fails to Edit PDF on Mac? 1. If your PDF file is the normal file, you can click the "Edit" button to edit the text directly. 2. If this fails to work, please check whether your PDF file is the scanned file or the image-based file. Actually, when you load your PDF file in the product, if you get a grey highlighted notice to inform you it is a scanned file, then you need to perform OCR before editing it. So please click the "Perform OCR" button in the notice (or click the "Edit">"OCR" button in the toolbar) and choose the correct language of your PDF content to perform it, you can also set the page range and DPI as you want. 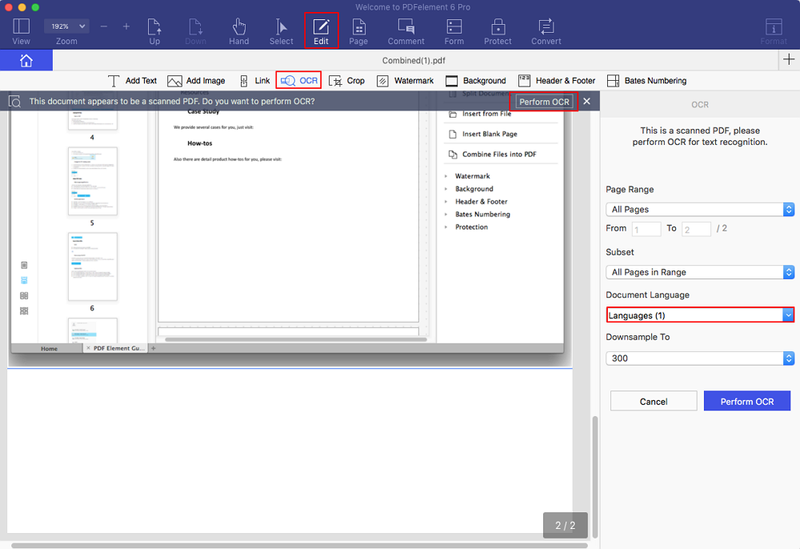 After performing OCR, the new created PDF file will be opened in the program automatically, you can click the "Edit" button to edit it again. Here are more details about how to perform OCR. What to Do If the Text Is Not a Straight Line in the Converted Word File on Mac? How Do I Set PDFelement As the Default Program to Open PDF Files on the Mac?